Berry on Dairy: Cultured Dairy Product Trends 2017: Whole-ly Cow! Cultured Dairy Product Trends 2017: Whole-ly Cow! As the great Harry Carey would have said, Holy Cow, 2016 was one heck of a year. And 2017, Whole-ly Cow, it’s going to be a grand one for cultured dairy products. The cultured dairy products sector includes fermented dairy foods such as cottage cheese, cream cheese and sour cream. Though it does not include yogurt and similar cup and drinkable products, it does include products made from yogurt, such as dips and spreads. It also is a category that’s on fire. Here are the top-five trends and 10 recent innovations that complement them. 1. Whole Milk and Cream. Fat is back. When you formulate many cultured dairy foods with whole milk and cream you can often eliminate some or all stabilizing ingredients. Culture selection is paramount. Cultures not only ferment lactose to lactic acid, and thus lower the pH, which in turn coagulates the milk proteins, cultures can also produce exopolysaccharides, which influence product viscosity. The right combination of cream and cultures allows for a very clean and simple ingredient statement, right on par with what today’s consumer is looking for. 2. Worldly Inspiration. Have it be bold and spicy flavors, ethnic herbs and veggies, or simply a recipe from a foreign country, today’s consumer is seeking out food adventure. The simplicity and naturalness of cultured dairy foods melds well with a touch of the unknown or unexpected. Remember, in sweet products, make efforts to keep added sugars as low as possible. 3. Snackable Protein. Cultured dairy foods lend themselves very well to individual portion sizes, with most being concentrated sourced of protein, the macronutrient today’s consumer cannot get enough of. The opportunities to innovate in the snacking space are immense and should not be ignored by any cultured dairy foods manufacturer. High-protein snacks---made with high-quality dairy proteins—have the ability to increase satiety and improve muscle mass. This can assist with life-long weight management and aged-related muscle depreciation. The calcium in these products is an added bonus. 4. Probiotics. These beneficial bacteria have really been resonating with consumers. So much so that the Council for Responsible Nutrition (CRN), and the International Probiotics Association (IPA), an international membership organization of probiotic companies, issued scientifically based best practice guidelines in early January for the labeling, storing and stability testing of dietary supplements and functional foods containing probiotics. The guidelines serve as a roadmap for companies producing and marketing these products to ensure that they meet consistent, high-quality standards. You can access them HERE. Stressing the importance of providing meaningful information to consumers, the guidelines recommend that the quantitative amount(s) of probiotics in a product should be expressed in colony forming units (CFUs). Labeling probiotic products in CFUs gives consumers the best information possible when it comes to the viable microorganisms present in the product throughout shelf life, according to experts at the organizations. 5. Simply a Better-for-You Option. Many cultured dairy products can be flavored and packaged in such a way to serve as a more healthful alternative to similar products, such as high-fat dressings and oil-based dips and spreads. Seasoned whipped cottage cheese makes the perfect protein bread or bagel spread and can right the coattails of the popular avocado toast. Non-dairy companies recognize these opportunities. It’s time for dairy processors to get busy. That fifth trend is best exemplified by this product that was just announced yesterday by Campbell Soup Company, which owns the Bolthouse brand. 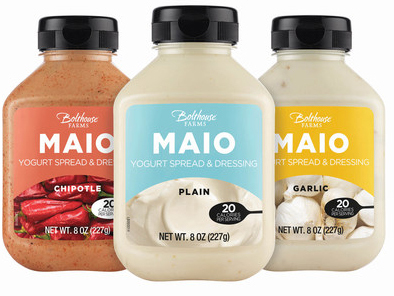 Bolthouse Farms MAIO is a new line of refrigerated, yogurt-based spreads made with clean ingredients. It is scheduled to hit grocery shelves beginning February in Northern California Safeway stores. The MAIO spreads are available in three craveable flavors—Chipotle, Garlic and Plain--and have the same creamy, rich texture people seek in a traditional mayonnaise but with lower fat and calories. Each product in the line contains only 20 calories and 1 gram of fat per serving, and most importantly, delivers on taste, according to the company. The MAIO spreads are non-GMO, gluten free, contain no artificial flavors, have 0 grams trans-fat. They come in 8-ounce bottles with a suggested retail price of $2.99. Kraft Heinz is rolling out Philadelphia multi-grain bagel chips and cream cheese dip snacks. The 2.5-ounce dual-compartment pack varies in flavor of cream cheese dip. There are four. They are: Brown Sugar and Cinnamon, Chive and Onion, Garden Vegetable and Strawberry. With snacking now ubiquitous--more than three in five (64%) consumers agree that snacking is necessary to get through the day, including 77% of millennials, according to research from Chicago-based Mintel—cheese marketers such as Kraft Heinz are aggressively developing what they believe will be a winner with the growing number of snackers. Mintel data also show that millennials are more likely to be motivated by healthy snack options (68%); and that three in four (73%) consumers are willing to pay extra for snacks made with high-quality ingredients. A&M Gourmet understands snacking. The company now offers simply simple low-fat cottage cheese blended with herbs and spices into a smooth dip and spread. Two varieties of 8-ounce cups are already in the marketplace. They are Chipotle Lime and Herb & Garlic. More are in development. Both flavors also are available in 2-ounce single-serve portion containers sold in four packs. The 2-ounce portions are currently part of the brand’s Protein Pickup refrigerated snack pack, which also contains quinoa crackers and an energy bar. 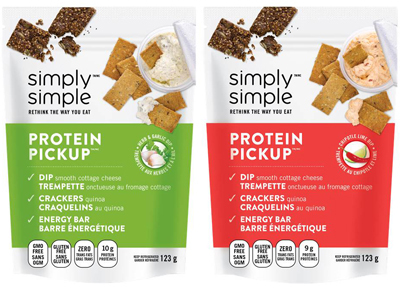 All of the simply simple dips and spreads are made with GMO-free ingredients and are gluten free. Muuna cottage cheese is a new concept in curds and whey. The brainchild of Gerard Meyer, the former CEO of Soda Stream North America, Muuna is set to modernize the cottage cheese industry by offering a new taste and creamy texture experience by combining innovative dairy technology with a proprietary recipe and high-quality ingredients, according to the company. The 150-gram cups come in plain, as well as five fruit flavors, all made with 2% milk. Free of artificial colors, flavors and sweetener, as well as gluten, the cottage cheese gets a protein boost from the addition of milk protein concentrate. Seattle’s Darigold just gave its Mexican-style Sour Cream (Crema Agria Mexicana) a makeover to differentiate on shelf and attract home cooks. This topper and cooking cream is not hot or spicy, rather it has a tangy flavor with a thick and rich flavor. The co-op encourages use in dips and savory dishes as well as a garnish. WhiteWave Foods Co.’s Wallaby brand offers a European-style organic sour cream that prides itself on being made with only two ingredients: cultures and fresh organic cream. This simple recipe yields an ultra-rich sour cream, with luxurious taste and creamy texture. It’s sour cream without the sour, refreshingly redefined, according to the company. Real sour cream is the name of the game in two new lines of boldly flavored dips. 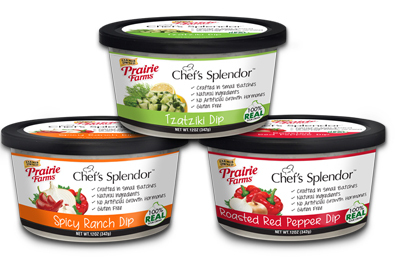 Prairie Farms launched Chef’s Splendor Dips, a specialty dip line that is on-trend with evolving food cultures. The bold and spicy dips, made with simple ingredients, are bursting with flavor and are sure to instantly accelerate taste buds from 0 to 100, according to the company. They are made by blending real sour cream with different vegetables and spices to achieve a delicious, thick and creamy texture. The three varieties are: Roasted Red Pepper, Spicy Ranch and Tzatziki. The full-flavored dips are crafted in small batches with milk and cream from cows not treated with artificial growth hormones, use natural ingredients and are gluten free. 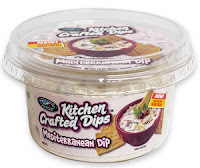 Lakeview Farms recently introduced Kitchen Crafted Dips. The new line comes in 12 culinary-inspired varieties. They are: Artichoke Jalapeno, Buffalo Blue Cheese, Creamy Jalapeno, Cucumber Garlic Ranch, Dill, Fire Roasted Red Pepper, Mango Peach Salsa, Mediterranean, Salsa Sour Cream, Spicy Three Pepper, Spinach Parmesan & Bacon, and Sweet Onion & Bacon. The dill variety is based on whole milk and cream, while the others are made with real sour cream, with some also including cream cheese. Mediterranean is a unique blend of artichokes, feta cheese, olives, peppers and more. 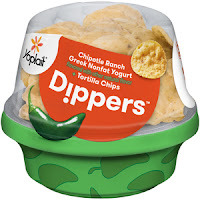 The Yoplait yogurt brand has extended itself into the interactive snacking sector with Yoplait Dippers. The dome-style container includes sweet or savory nonfat Greek yogurt in one part and crunchy dippers in the other. The new single-serve packs come in six varieties. They are: Caramelized Banana Greek Yogurt and Choco-Drizzled Pretzels, Chipotle Ranch Greek Yogurt and Tortilla Chips, Coffee Chocolate Chunk Greek Yogurt and Cinnamon Crisps, Raspberry Chocolate Chunk Greek Yogurt and Choco-Drizzled Pretzels, Toasted Coconut Greek Yogurt and Honey Oat Crisps, and Vanilla Bean Greek Yogurt and Honey Oat Crisps. And lastly, Snøfrisk is not a new product, in fact it was introduced by Norway's Tine Dairy during the Winter Olympic Games at Lillehammer in 1994. However, it is rather new to the States. It is being imported by Norseland. 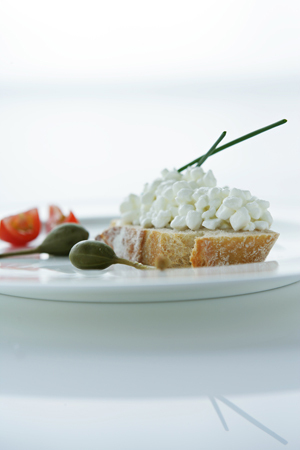 Snøfrisk is a white, unripened cream cheese made from 80% goat’s milk and 20% cow’s cream with only 1.5% salt added. 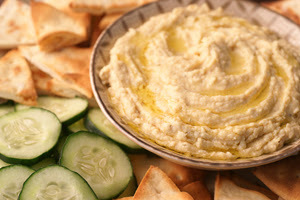 It is easy to spread and can be used on bagels, with crudites or as a dip or spread. The plain variety is now being joined by Dill, Horseradish, Ramson Garlic and Red Onion & Thyme, flavors indigenous to Norway.